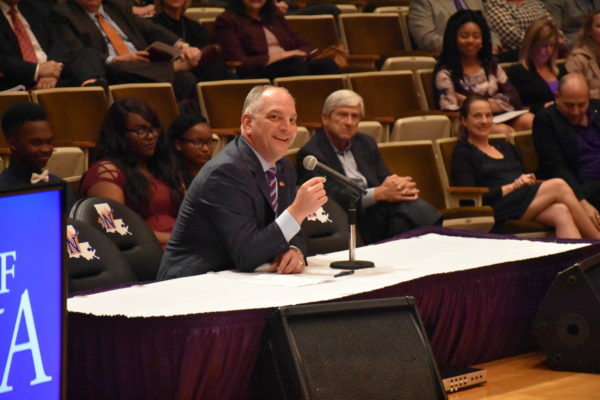 Governor John Bel Edwards addressed the Board of Supervisors for the University of Louisiana System and discussed the past year and the opportunities and challenges that are ahead. Edwards will attend the Northwestern State University Christmas Gala later this evening. Registration is open for the Universities of Louisiana Inaugural Conference. Limited to the first 350 registrants, the two-day For Our Future conference will provide tools and strategies that will equip university faculty and staff to help achieve the six aspirational goals set forth in the Universities of Louisiana Strategic Framework. The conference will include keynote speakers and three tracks focusing on Success, Innovation and Stewardship. Visit www.ULSystem.edu/Conference to register or for information regarding an open call for proposals and outstanding faculty and staff award nominations. The University of Louisiana System Foundation distributed 30 AT&T first-generation scholarships. Students awarded the $500 scholarships are enrolled full-time in STEM programs throughout the Universities of Louisiana. AT&T donated $15,000 to the Foundation earlier this year. More than 250 students applied for the award. 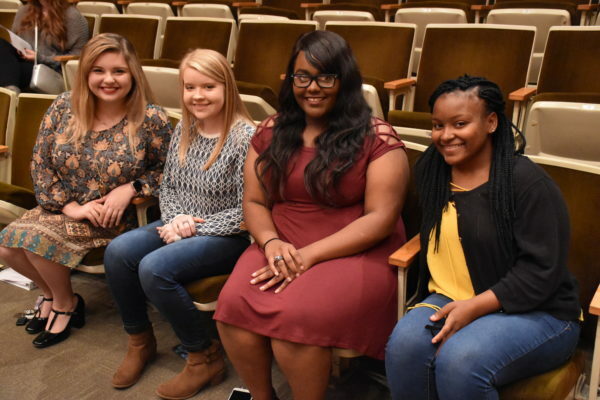 From left to right: Northwestern State University AT&T Scholarship recipients Taylor Powell, Miranda Coffey, RaLonda Armster and Cherish Netter. Not pictured, Char’Tarian Wilson. 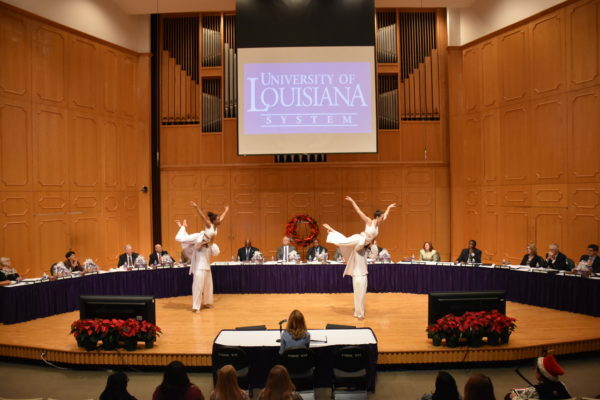 The Northwestern State University Dance Company performed for the Board of Supervisors for the University of Louisiana System prior to their approval of a letter of intent to develop a new academic program leading to a bachelor of fine arts in dance. Dancers include Charles Anderson Jr., Skilynn Fontenot, DeAngelo Renard-Bouttee and Elaina Guerrero. Northwestern State University’s request for approval of a Letter of Intent to develop a New Academic Program leading to a Bachelor of Fine Arts in Dance. University of Louisiana at Monroe’s request for approval of a Letter of Intent to develop a New Academic Program leading to a Doctor of Occupational Therapy. University of Louisiana at Monroe’s request for approval of a Memorandum of Understanding with Southern News Group to facilitate development of an expanded group of qualified registered nurses to work in American hospitals. University of New Orleans’ request for approval of a Letter of Intent to develop a New Academic Program leading to a Master of Engineering in Systems Engineering. McNeese State University’s request for approval of a contract with Mr. James E. Landreneau, Head Softball Coach, effective September 1, 2017. McNeese State University’s request for approval of a contract with Mr. Justin W. Hill, Head Baseball Coach, effective December 1, 2017. Southeastern Louisiana University’s request for approval of a contract with Mr. William Jake Narro, Head Golf Coach, effective September 1, 2017. McNeese State University’s request for approval to rename the Department of Performing Arts to the W.A. and Dorothy Hanna Department of Performing Arts in honor of the Hanna family. Nicholls State University’s request for approval to name rooms in the computer lab located in Betsy Cheramie Ayo Hall in honor of the Callais family. Northwestern State University’s request for approval to enter into a Grounds and Facilities Lease Agreement with the Northwestern State University Foundation, a 501(c)3 not-for-profit corporation, to lease existing space in the Friedman Student Union building and NSU Nursing Campus building for operation of a campus bookstore through a sublease with an outside vendor pursuant to the authority vested in La. R.S. 17:3361. University of Louisiana at Monroe’s request for approval to sell the KEDM Public Radio Tower located approximately 15 miles off the main campus. University of Louisiana at Monroe’s request for approval to enter into a Grounds and Facilities Lease Agreement with ULM Facilities, Inc., a 501(c)3 not-for-profit corporation, to renovate an area of Malone Stadium into a new athletic treatment facility pursuant to the authority vested in La. R.S. 17:3361. Nicholls State University’s request for approval to enter into a Cooperative Endeavor Agreement with Friends of Bayou Lafourche to fund improvements for the University’s bayou side property along Bayou Lafourche. University of Louisiana System: request for approval of revised Internal Audit Charters for the System and related campuses. University of Louisiana System: discussion of Fiscal Year 2017-18 first quarter financial reports and ongoing assurances. Northwestern State University: request for approval to appoint Dr. Greg Handel as Dean of the College of Arts and Sciences effective January 1, 2018. Northwestern State University: request for approval to appoint Dr. Kimberly McAlister as Dean of the Gallaspy College of Education and Human Development effective January 1, 2018.